This section provides a tutorial example on how to create a Web page to show the difference between two images, one with non-transparent background color and one with transparent background. Now I want to test the GIF image with transparent background with a simple Web page. On the left hand side, you see the peace image with non-transparent background. The background of the image is not transparent, because it has a visible solid white color. 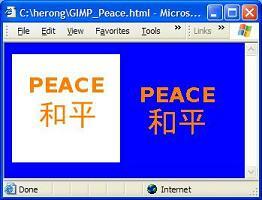 On the right hand side, you see the peace image with transparent background. The background of the image is transparent, because the blue color of the web page showing in the background of the image.